Elmer and Gerry Whalen launched this firm in 1945 from their kitchen table in Springfield, Ohio. 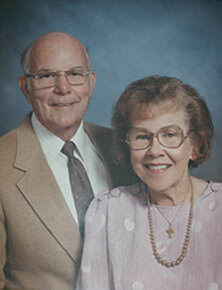 Elmer had worked as an accountant for a large manufacturing company and began helping smaller businesses on the side. As Elmer’s client base grew, he was able to start his own accounting firm. And here we are today – 72 years later! Whalen & Company is now home to more than 36 staff members, including 20 CPAs. We have clients throughout Central Ohio and across the world, ranging from individuals to multi-million dollar businesses. Our firm has come a long way in 72 years, but we have not strayed far from the Whalen family’s kitchen table. Elmer and Gerry Whalen’s founding principles remain strong today: we put people first, we personalize our services to meet our clients’ needs and we value integrity above all else. Want to learn more about Whalen & Company? Contact us.